Reigns: Game of Thrones is now available on Android. The game is a branch of swipe ’em up series Reigns. It features the same choice-based gameplay but utilizes the Game of Thrones storyline and characters. Players can play as Cersei Lannister, Jon Snow, Daenerys Targaryen, Tyrion Lannister or Sansa Stark and try to take control of the Iron Throne. While victory is in reach, this is a Game of Thrones story after all — death awaits around every corner. 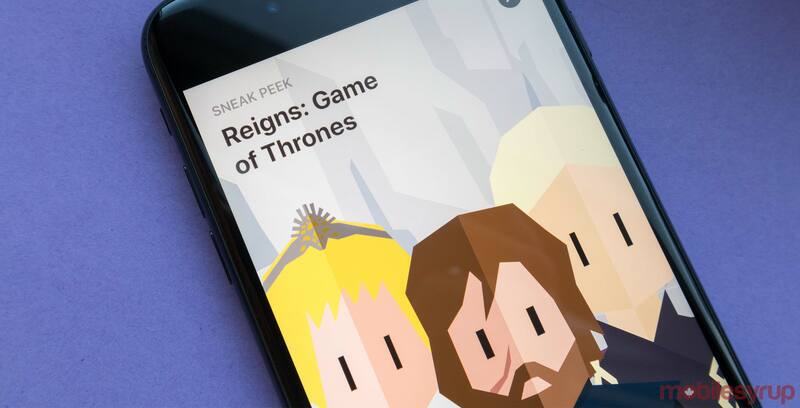 Like previous entries in the series, Reigns: Game of Thrones features minimal art. It’s also bigger than the other entries. Players can also expect storylines to differ from the TV shows and books as they’re in control of events, to an extent. This adds to the gameplay experience, as players can work to create their own stories within the Game of Thrones universe. Reigns: Game of Thrones is available on the Google Play Store for $4.99. Additionally, previous versions of the game like Reigns and Reigns: Her Majesty are discounted to $1.29. If you haven’t played those, it’s a good time to pick them up. Furthermore, Reigns: Game of Thrones is available on the App Store and Steam as well. Interestingly, the iPhone version utilizes the True Depth camera if you have an iPhone X, XS or XS Max. It’s a unique way of interacting with the game.